I have this in my collection, I’m trying to ID it if possible. 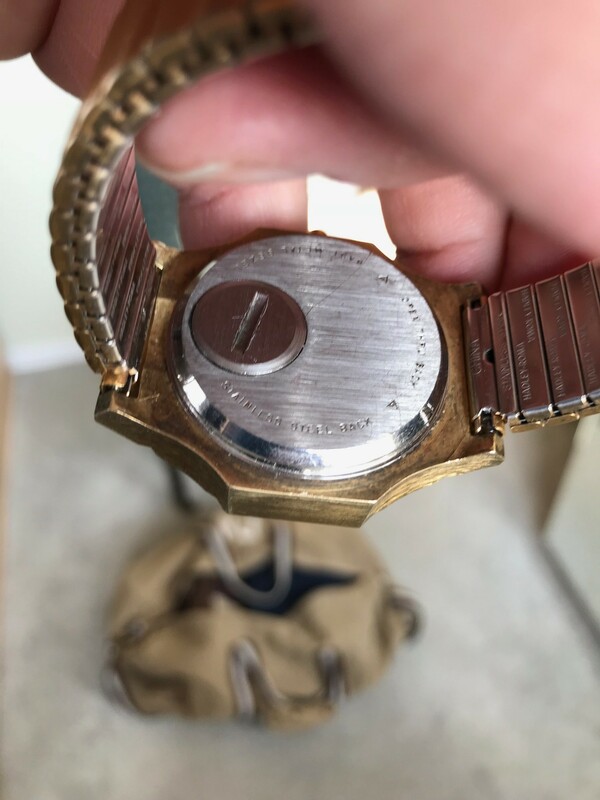 I also dn’t Know if the case back is removable or not, or if it’s just the battery hatch that comes off and the movement is supposed to be sealed in. Any knowledge or advice would be gratefully received. Picture of the case back? I assume where those little triangles are pointing is where you would use a case back knife to pry the back off, you might need a case press to get it back on though. Thanks Richard, that’s a good tip, I’d not thought about where the arrows were pointing. I’ve tried to open it a few times but probably not from there and I was worried about damaging the case as the force I was using was going up with no success! I will have a go when I return home and have a look at the case under magnification to see if there are any tell tale hollows that look designed for a knife. Luckily I have a case press too. Will report back in the next few days. 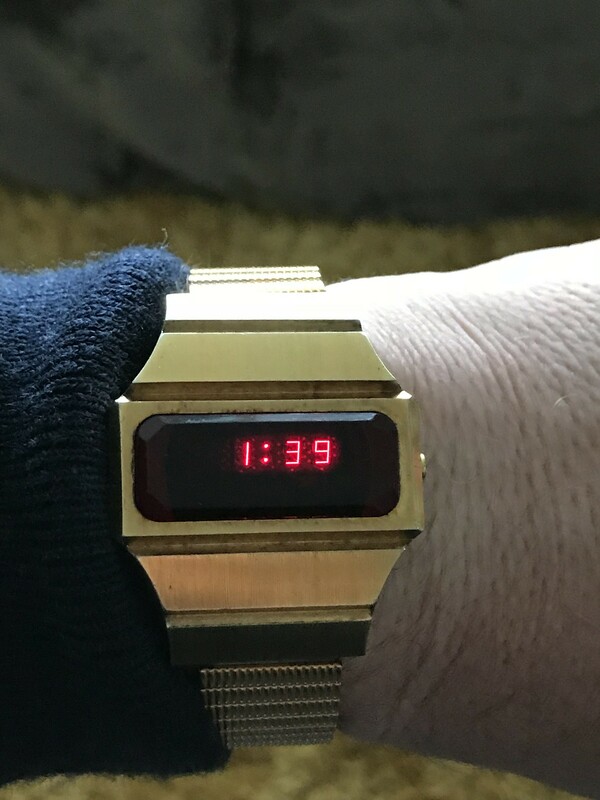 I don't know if you've found an answer to your question about this watch, as your last post looks like it was back in February, but, this is actually a Benrus, and the model is called the "Galaxy", the Benrus Galaxy, from about 1976. 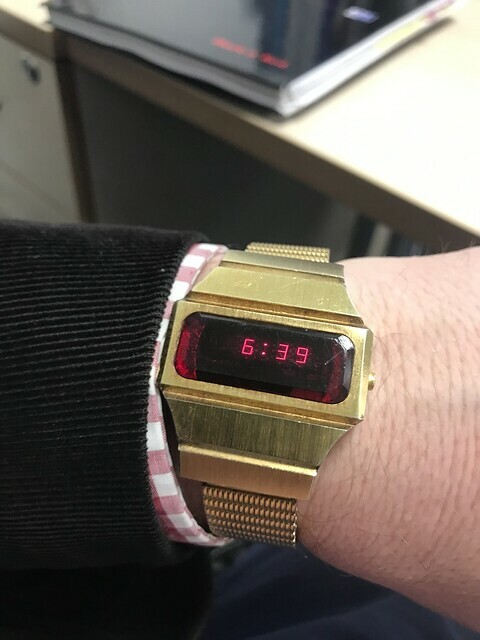 I've got the original advertisement for it somewhere on my computer, if you'd like to see it, and it says that this watch originally sold for $189.95 when new, which was a lot of money, waaaay back in the mid-70's! 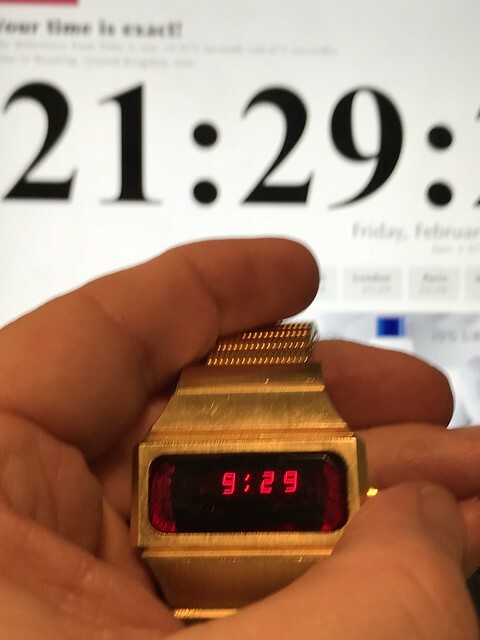 Now, and as to opening the caseback, well, I've got about four or five of these watches in my collection, and whenever I've wanted to open one, I'd simply insert a large flathead screwdriver into that notch that's just below the battery hatch, and pry the lid off. 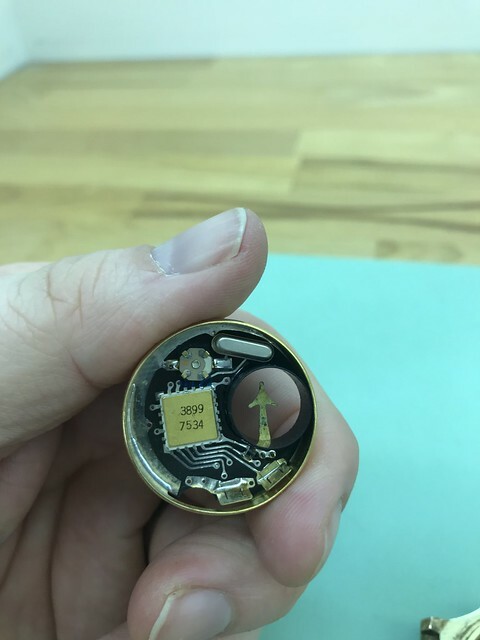 As the edge of the caseback extends out over that notch, just enough to place the screwdriver there, I think that that might be the way that it was intended, to open one of these watches. 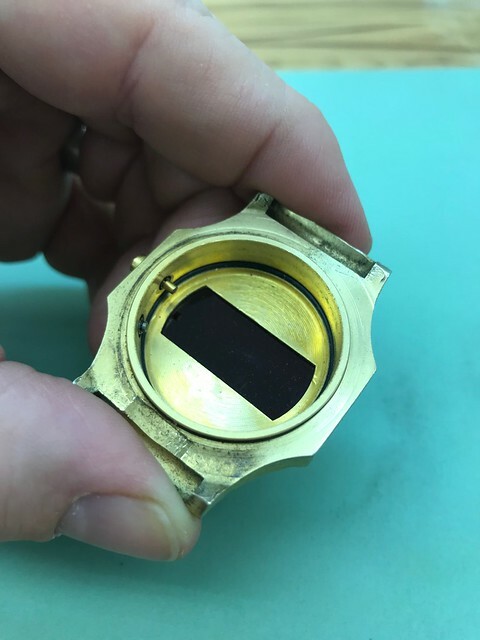 Ohh, but if you do decide to open it, be very careful when you go to press the caseback onto the watch case, making sure that you have a sufficiently large enough die on your watch press, so as not to put any undue pressure on the raised plastic red lens of the watch. 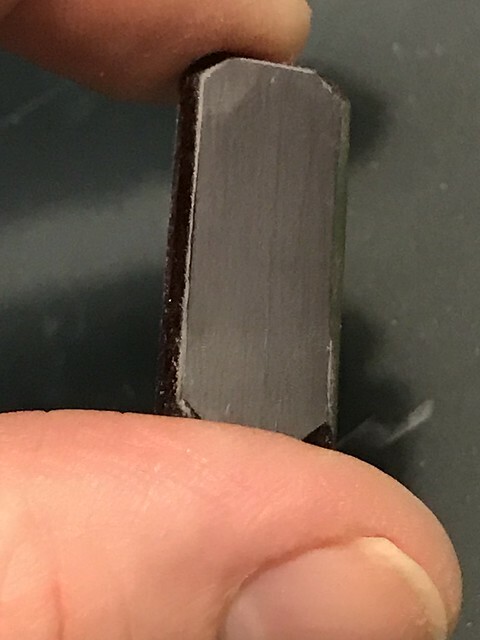 If you have a really large, concave (sort of hollowed-out) die, that will go over/around the lens, without actually putting any pressure on the lens itself, I'd use that. I've gotten a couple of these watches before, that had cracked or split lenses, after someone had used a watch press die that was too small to fit over the raised red lens, and ended up breaking it.. Anyway, I hope this info helps, and good luck :) . Thanks Charles, that’s great info! I had thought that was the way to open her up but when I tried it was so seized on it looked like it was going to damage the watch case so I quit. I guess I may have to try again at some point. And I’d love to see your advert if you find it, would be very interesting! Yes, certainly, I'll see if I can successfully add the photo of the advertisement, to this message. The ad was from around 1976, and it actually shows THREE different Benrus red LED models...the Benrus "Firestar", Benrus "Galaxy", and yet another one, simply called the "LED I". Thank you, very interesting and I've saved a copy. You're right, it seems this watch cost a fair bit back in the day, which is logical I suppose as it was new tech. Using the google calc it looks like this yellow one at $150 was the equivalent of around $650 in today's money. But doing a tiny bit more digging and using a better comparison maybe, a new Omega Speedmaster or a Rolex Sub would both have been around $350. Just to annoy myself more, the exchange rate was around $2/£1, so I could have bought a new Speedy or a Sub for £175 each... I've probably got the sums a little out but I'm close enough to say zoiks! As I do wear this one from time to time due to it being as funky as James Brown, I thought I really should have a little tidy up of it. And while I was at it I thought I’d record the internals for the collective in case they ever come in handy for someone at some future date. So here we are with the watch. 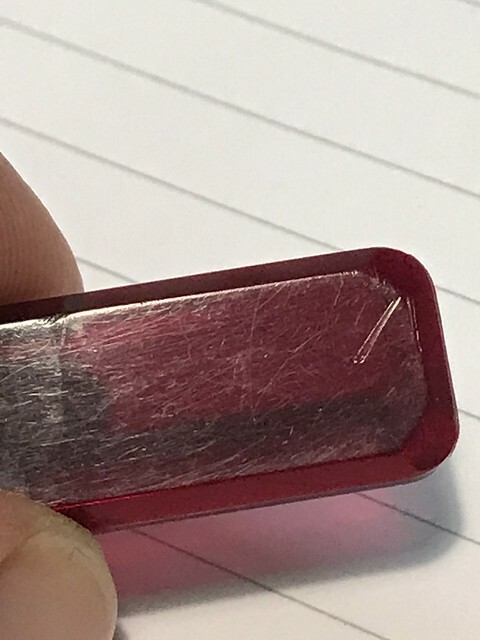 Lovely big scratch across the plastic and the pushers were extremely sticky making it a bit of a lottery when setting the time and date. Then I finally got it apart. It did not want to seperate so a bit of gentle persuasion was required in the end. Here is the module, display side, battery side and the side. You can quite clearly see a lot of tarnishing to the battery contact which is the lovely fat arrow. That would have to be very carefully cleaned up to improve the battery contact but not break it off the 40+ year old soldered contact. Here is the case before and part way through a clean. Popped the glass off and gave it a whizz with some sandpaper from about 400g to 2500g then some diamond paste down to 0.25micron. And apologies as my phone ran out of charge and I didn’t have a charger handy. 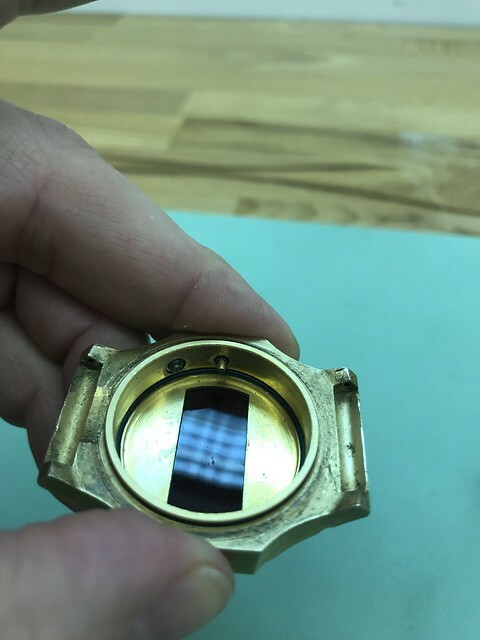 In addition to the above the inner and outer gaskets were removed and inspected, the pushers were removed and throroughly cleaned up and the case and bracelet got carefully brushed with a fibreglass pen and then had 10minutes in an ultrasonic. Then the case was reassembled and the glass reinstalled using Seiko UV crystal glue and left for two days on a south facing windowsill. For those who are interested, there appeared to be no manufacturers mark anywhere internally or externally. 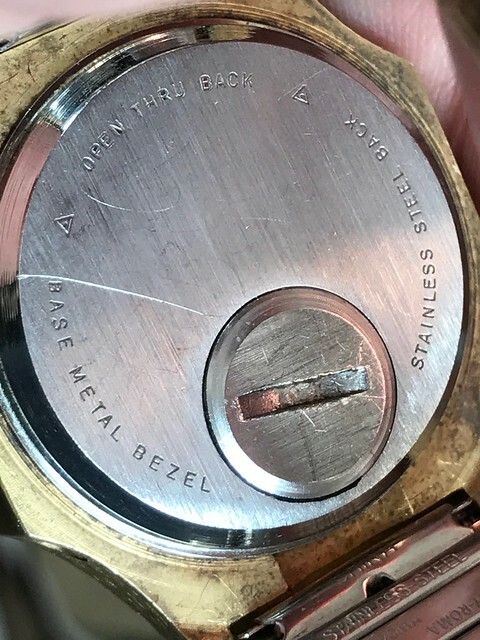 The only external marking are on the caseback which is shown in an earlier post on this thread and doesn’t tell you anything about the watch. And if you’ve got this far, well done and I hope it wasn’t too boring! My, you ARE a very enterprising fellow, with the watch tinkering, eh? I like to do the same, although probably/obviously not to the great extent, that you do...polishing lenses, cleaning contacts, etc., yes, certainly...but, usually, whenever I've tried to do something like replacing a pushbutton, etc., I just usually mess things up, to where they're even worse than before . 1) One, works and keeps really good time, BUT, it has one single missing segment...just one...in the very last digit, which is somewhat annoying, but least it's still quite useable and wearable, and looks great! 2) Then, another one also works, but it runs a bit fast. I haven't gotten around to timing it in a while, but, I'd say maybe about a half-minute, per day? A few months ago I sent it off to a friend to see if he could adjust it, but, he had no such luck. Still, I guess it could still be worn okay, and just readjust the time, every few days...? 3) The third one does work, too, but has a rather annoying issue...whenever you enter the setting modes to try and set it, the darned thing then won't let you EXIT the setting modes, once you're done, and I have yet to figure out why that is. 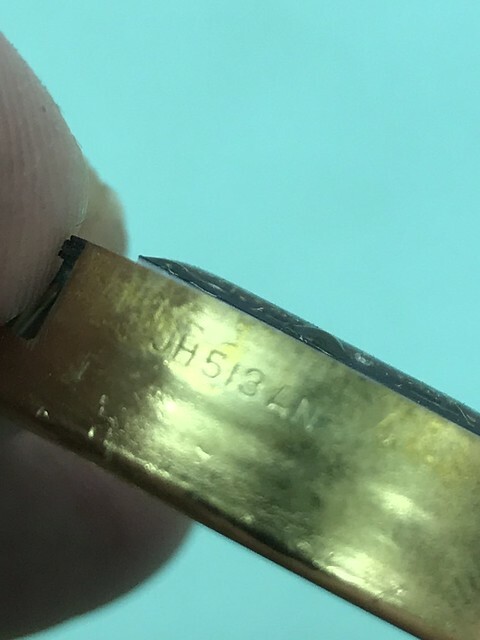 4) As for the fourth watch, well, it doesn't work at all, PLUS, some previous owner managed to crack and break the lens, exactly in the middle, so that it's now in two pieces, AND has a small chip on one edge, as well. 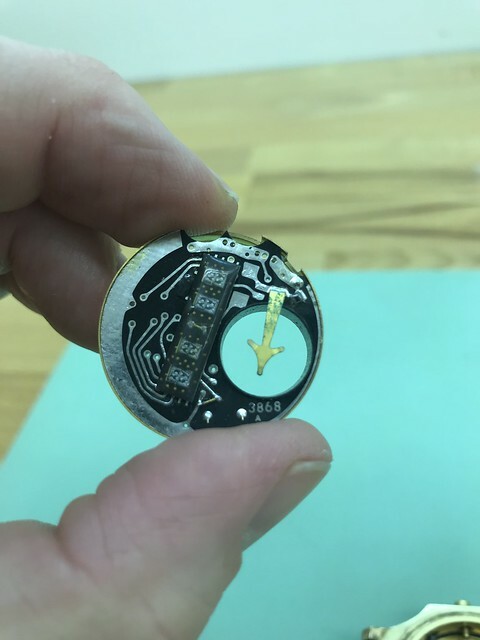 The broken lens was obviously caused by someone trying to press the caseback onto the watch case, without the use of a really large, concave die on their watch press, so as to not put any pressure on the lens itself. Ahh, well.. .
Well, anyway, that's about it, for now, but I wanted to reply to your latest post, and let you know that I DID look at all of your pictures and read your post, and I can tell that you really have a fondness for your Benrus, just as I do, for the darned quirky things...LOL. Thanks Charles for your kind words. 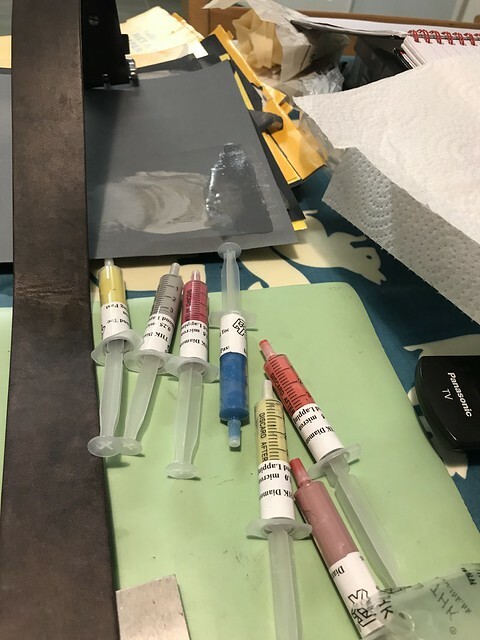 I do like tinkering, although I spend most of my spare time in the guts of old mechanical watches with the odd old quartz thrown in; so this was a big departure for me. I do like this watch though, as does my 7yo, so I wanted to keep it going for him when he's older. 1) Could be a dirty contact. Could be much worse things but that's what to check first. 2) I don't know if these are adjustable, I didn't see a trimmer but I wasn't looking for one. 3) Most probably a sticky pusher? Fairly simple to resolve if it is. 4) Who knows... maybe good for spares for one of the first three though. 1. Most probably a wire bond is off, could possibly be repaired with the right equipment. 2. Don't see a trimmer on the module...other than a QC swap I'm not sure what can be done about it. 3. Possibly a pusher stuck, test it outside of the case, usually an easy fix with a bit of lubrication. 4. If you mean the lens over the display it is beyond economic repair. Thanks, guys, for your replies, I appreciate it very much. I had originally responded to Phil's query a while back, about his Benrus watch, and trying to help him identify it as a Benrus "Galaxy", of which I have a few of them. However, as I had mentioned, they usually do have at least some problems, here and there. But, nevertheless, I think those "Galaxy"'s have a really neat case design, and the "double-stacker" module, where both batteries are stacked into one single battery well, I think was a really cool and unique module design....in fact, in addition to the standard-sized, 29mm modules that are in these watches that I have, I've also got a few of the EXACT same modules, but in a SMALLER, 25mm size;...but, no watch cases to put them in, so, I've no way to test them to see if they work, nor have I ever seen any Benrus watches with this type of module, but in the smaller, 25mm diameter. But, maybe someone else has..?